An artisan regional cheese manufacturer faced a challenge. Their production line was completely manual and very slow. The problem was that the operators had to manually denest and place clam shell trays on a conveyor. Then they manually place finished cheese balls in the clam shell. Once this was completed, the operator would manually close the calm shell. They turned to Wrabacon to manufacture a packaging line that would transform their production line from a completely manual system to a semi-automatic packaging line. The new system designed by Wrabacon consisted of a tray denester, a conveyor to transport trays to the operators, and an automatic lid closer. All equipment was built in stainless steel to meet the high demands and sanitation needs the food industry requires. Custom designed and manufactured a tray denester that denests plastic clamshells onto a moving conveyor at the rate of up to 30 per minute. The system works with two tray sizes: 4” x 8.75” and 5.38” x 5.38” Each are denested with the long edge leading on the conveyor. The trays are denested onto a conveyor where they will be manually filled by the operators. After filling, they travel downstream to a lid closer that automatically folds and closes the lids prior to transferring to downstream equipment. Operators manually load the trays into an adjustable 45 degree twin hopper with the open side of the tray facing down. Pneumatic cups extend up to the trays, pull one from each stack, pivot down over the conveyor and then release the two trays. The trays travel on the conveyor with the wide edge leading. After placing the tray, the process repeats—picking and then placing the two trays onto the conveyor. The denester utilizes a photo sensor to trigger the cycle. The sensor is mounted on the conveyor and when clear, the denester drops the trays onto the belt. The conveyor has variable speeds, so the denester rate is controlled by the speed of the conveyor. After denesting, the clamshells are manually filled with product. After filling, the clamshells travel downstream to the closer with the lid open. A rail guide and partially closes the lid as it transfers to the conveyor. Once the lid is partially closed, a set of powered rollers snap the lid around the perimeter of the clamshell. Wrabacon designed the closer with power rollers since applying pressure to the top center of the lid might not seal the container properly. The powered rollers are above the clamshell while a set of free spinning rollers are on the underside of the clamshell. By sitting over the two edges of the clamshell, the guides and rollers contact the edges of the container and ensure a proper closure. After closing, the clamshells transfer to downstream equipment for further processing. The closer is adjustable for the two tray sizes and can be easily adjusted via hand cranks and physical stops. 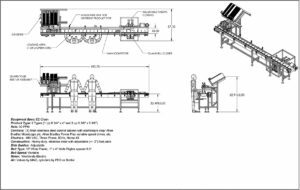 As part of this proposal, Wrabacon supplied (1) twin, adjustable hopper, tray denester with support frame, (2) 32” long denester hoppers that holds approx. 100 trays each, (1) main packing conveyor, (1) split belt clamshell closer and (1) control system. Click on the picture to see the plans. Filling Room Conveyors that Provide Reliability and Flexibility.